Yesterday, in Part 1 of this Music for Holy Week series, we introduced the historic practice of daily lessons through Holy Week covering the Passion accounts from each of the Gospels and reported how "The Singing Church" delivered the words of these accounts to their hearers in song. Yesterday, we heard excerpts from compositions of Johann Sebastian Bach and Heinrich Schütz, the two greatest German composers in history, which gave the account of Christ's Passion according to the Gospel of St. Matthew. Today, with much less introduction to the composer and his work, we share with our readers excerpts from Johann Sebastian Bach's Markus Passion. It is important to note, however, that these were not composed as performance pieces. 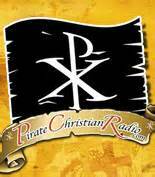 These were works of liturgical music, which set the appointed Gospel lesson to music and were intended for the context of worship. For more details on the composers, and their liturgical compositions, please refer to yesterday's post. 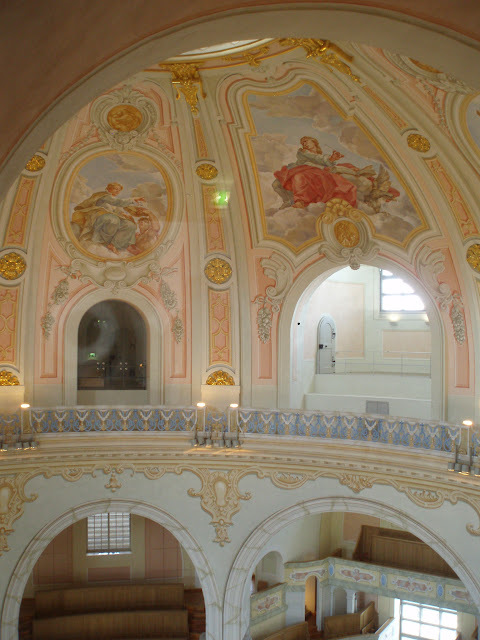 In addition to excerpts from Markus Passion, today we have included some images of the recently restored Frauenkirche in Dresden, in which one of the recordings featured below was made. 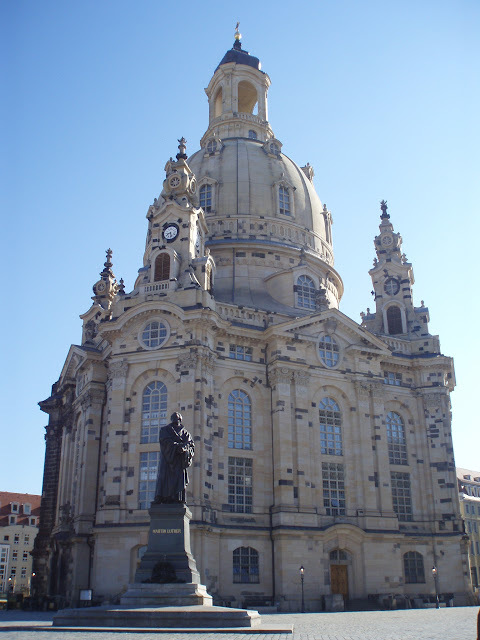 The site of the present-day Frauenkirche had been occupied by a large Gothic structure since the Middle Ages, but by 1722 had fallen into such a state of disrepair that it needed to be demolished and rebuilt. 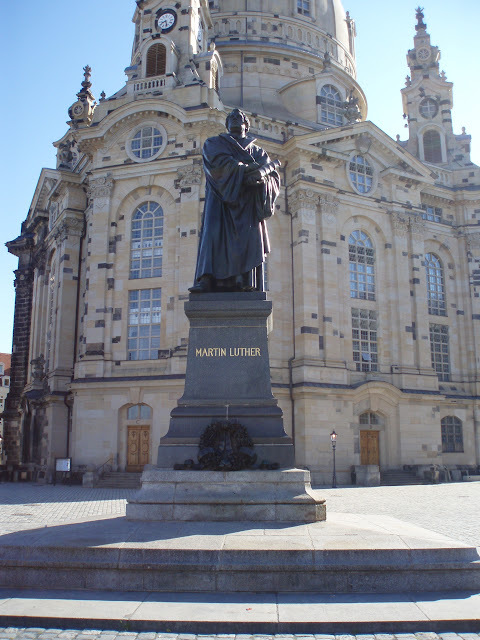 The rebuilding began in 1726 under the watchful eye of Dresden superintendent, Valentin Ernst Löscher (1673-1754) -- the last of the orthodox Lutheran theologians to emerge directly from the Lutheran Age of Orthodoxy. He is remembered for his vigorous polemic against the German Pietists under August Hermann Francke (1663-1727) and Joachim Lange (1670-1744), which is preserved for us in his Complete Timotheus Verinus, recently translated into English by Robert Koester and James Langebartels and currently available from Northwestern Publishing House. 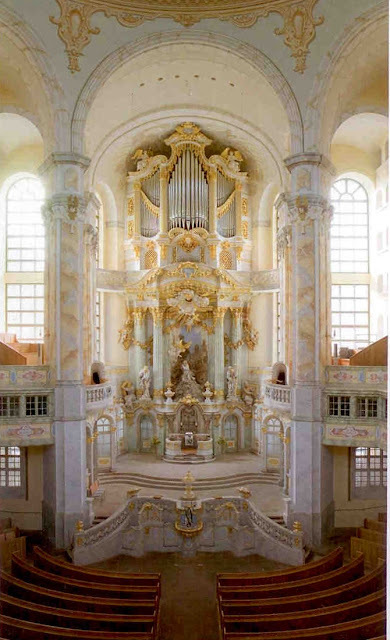 Designed by George Bähr and finally completed in 1744, the Frauenkirche stood from that time forward as a marvel of architectural engineering, until it was destroyed in the 1945 fire-bombing of Dresden. It sat, awaiting the fall of the Berlin Wall, as a dingy pile of rubble. Immediately following the end of Soviet occupation of East Germany, in 1989, efforts to rebuild it were organized, and work began in 1993. Working from original plans and historic photographs, the rubble was sifted for re-usable materials so that new materials could be constructed as required. It was completed in 2005.